The hunt is always on for bedroom ideas, particularly for bedrooms without any interesting architectural features. Here are some quick DIY bed canopy ideas, videos and tutorials, from a homemade bed canopy, to a four poster bed canopy, to take your bedroom decorating from drab to glam. These bed canopy ideas add character to any plain bedroom. 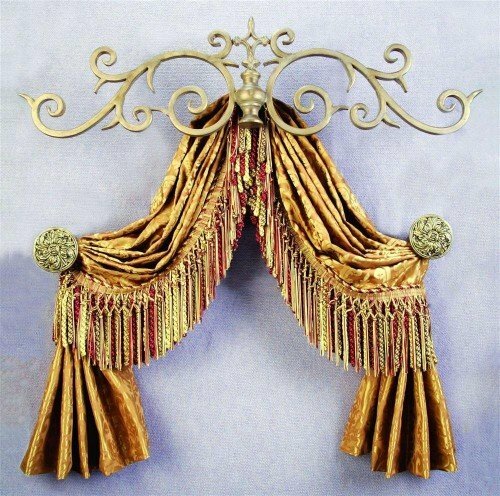 In some cases you don't even need a crown canopy, to get the full effect of lots of dramatic fabric. This crown bed canopy is small enough to create drama; this white bed canopy uses lace and netting for a sheer bed canopy look, keeping the room and mood light and bright. Often a bedroom is four simple walls. There are some great bedroom themes but in the end, a bed, rug, side tables and an accent chair constantly bring your eye down to the floor. A canopy draws your focus upwards towards the ceiling, making your ceilings look taller and your room feel bigger. 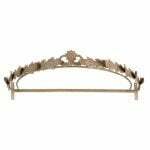 A princess crown canopy is often made from metal; aged brass or nickel or painted gold wood. 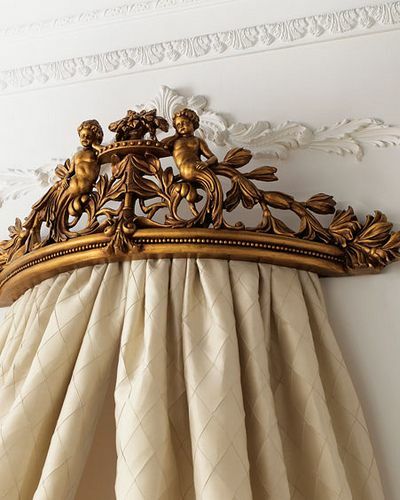 Further down this article you will find a bed crown canopy using an inverted decorative shelf. The one below is made by covering a half circle with fabric. It is perfect for a pitched roof or attic bedroom; filling the center piece and making it a feature. The bed canopy curtains are limited to the headboard and in the same fabric as the crown. It's an elegant, timeless look. A canopy bed frame, like this one makes decorating with bed canopy drapes, canopy bed curtains or fabric panels, fast and easy. This saves your ceiling from unwanted holes and brackets, that a ceiling bed canopy create. It does, however, limit the height of you bed canopy. This is only a problem if you have tall ceilings. What is so attractive about bed canopies is the extra soft fabric and color, which can create a more relaxed and luxurious room. The style of your curtains, curtain hardware and brackets can transform your room into a rustic country haven or give it a decadent, rich feel. Never feel that you are limited to a particular style. The choice is yours and depends on your choice of canopy curtains, hardware, coronas and colors. 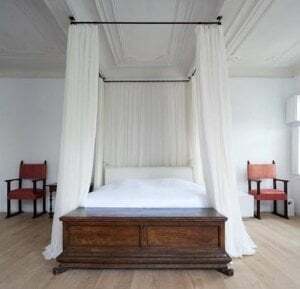 If you have a canopy bed like this four poster bed, add canopy bed drapes using any light billowing drapes, crisp sheer white cotton, coarse rustic linen, vintage or fresh silks and velvets, some gilt and tie backs for romantic bedroom styling. Mix sheer fabrics to keep your natural light in; many dark or heavy fabrics absorb the light and will make your bedroom darker. Canopy covers are easy to buy or make and come in a variety of sizes, shapes and colors. Ready made curtains are super easy, fast and inexpensive way to add fabric to your canopy. Lighter fabrics like muslin, cotton or light weight linens means you need less support from your canopy. While curtains can make putting together your diy bed canopy easy, don't shy away from using panels of fabric, drapery panels or even sheets as your canopy fabric if you have them, or prefer them, to ready made curtains. Fabric colors for canopies depend on your color scheme and bedding. But that's not all. Remember, lighter shades such as putty, off whites and chalk tones leave rooms feeling restful. These are elegant colors in any bedroom that won't make your room feel either crowded or dark by absorbing your precious natural light. If your bedroom needs rich, deeper canopy curtains for heightened glamor or to balance your decor and bedding, use ribbons, tassels or fabric panels. These work best in larger rooms with more space and natural light. But there are no rules. If deeper, richer colors suit your room and your color scheme, then use them. Canopy Beds - Which Bed Crown Canopy Will You Choose? Not everyone has a four poster or canopy bed. As with a lot of home decorating, its the look and feel you want to capture. Which means that you don't need a canopy bed to get the look you want. like the one below from Amazon. It's made of resin and has the curtain rod inside. Perfect! , like below? It looks simple and much easier to install and still perfect for canopy drapes. If your ceilings are low then go as high as possible towards the ceiling, to make them looker higher. If your ceilings are very tall or you have a vaulted ceiling, a wall canopy may be best. Wall attached canopies are perfect for many rooms, they can be easier to attach and sturdier. If your bedroom is smaller, a wall canopy frame is a great way to get the look, without loosing too much air space and without the canopy over taking your bedroom decorating theme. This type of canopy often take less fabric, making them less expensive as well as easier to install. You can use single or double curtain rods, a semi circle bracket, curtain tie backs or a decorative shelf to create your canopy frame. In the video below from Bettyjean Pace, the canopy is a simple swag hook. Along with a garland, some flowers, ribbons, two sheer curtains and a few bands, it's inexpensive canopy but I think you'll agree that the look created is elegant and inspiring. You can go minimalist, fancy or hide the canopy bracket completely. Here's a great idea for a bedroom canopy using an inverted decorative shelf! The angels are extra but this is such an inexpensive way to create your own bed canopy. Simply choose your fabric panels from extra long curtains, burlap, muslin, sheeting or drapery. Gather and staple to the decorative shelf. Cover the underside with fabric to cover the staples and unfinished fabric edges and add other decorative elements to the top if you want to. You can buy pieces different pieces, add and paint them. Be as creative as you want! Use a strong metal corona canopy fixed to the wall above your bed. Curtains or drapes are hung from the rail on the inside of the corona. Looks great and is easy to fix to the wall. You can buy purpose made pieces like this one below or use a piece of decorative garden trellis. You can create your corona by using a simple embroidery hoop. Ceiling attached canopies can look amazing. Again you can use curtain rails, a semi circle bracket, curtain tie backs or a decorative shelf to create your canopy frame. Attaching the fabric to the ceiling makes the room feel grander. Muslin is an easy choice of fabric. Its lightweight and its see-through qualities mean very little natural light is lost. If you add decorative roses, or other fabric pieces, make sure you don't add additional weight to the canopy. This look is great if you don't want to use a crown canopy or have a slanted ceiling. It keeps the focus on the fabric, not the crown. The video below creates a canopy using a ceiling hook and and embroidery hoop. Again, this is not an expensive bed canopy but you can get some great ideas. 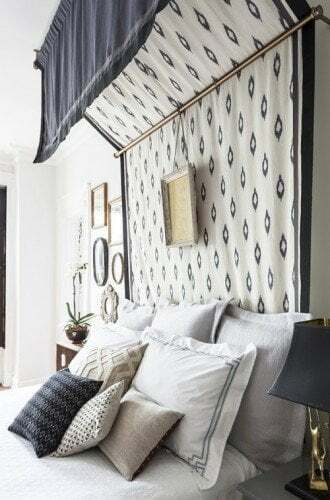 These bed canopy ideas are just a few ways you can create an over head canopy look without great expense. 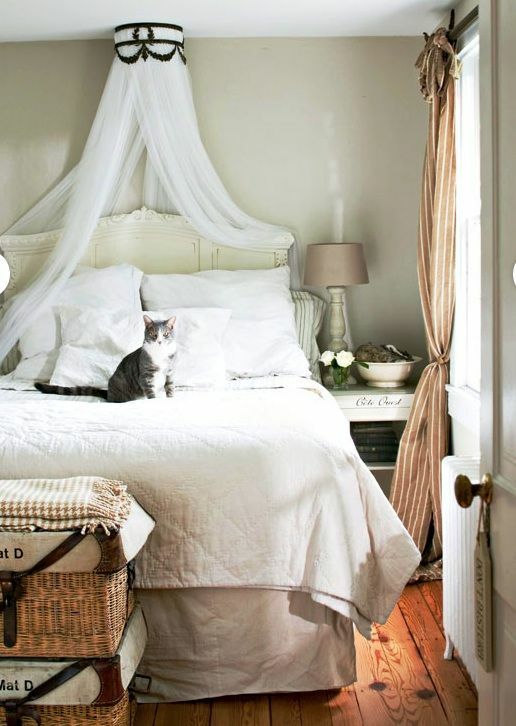 Do you have a bed canopy idea you would love to share? Please leave a comment below and don't forget to visit on Facebook, where there are more ideas for you to swoon over! Love it, I am sprucing up my twin granddaughters bedroom I have made for the her at our home, now I want to change it because they just turned10 a couple of weeks ago. great to hear from you! There are so many great things you can do! Especially for 10 year old girls. Have fun and I hope I gave you some inspiration.